The Wilmington Grill 1/2 Griddle Kit allows you to turn 1/2 of your grilling surface into a griddle. Ideal for cooking veggies, hamburgers, shrimp and a variety of other foods. 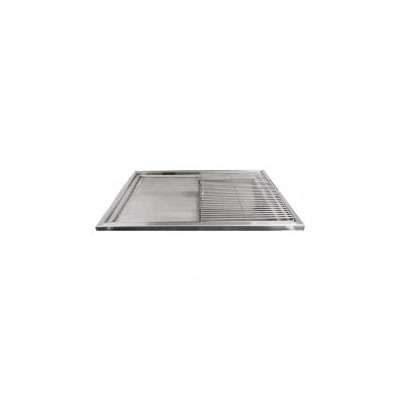 This model features a one-half griddle, one-half grate and is made from heavy duty 304 stainless steel. Griddle surface works on the left or right side of the grill and can easily removed to use the full grate when needed. The 1/2 Griddle Kit includes our griddle frame adapter, griddle plate and 1/2 grate. Kits available for Classic, Deluxe, Drop In and Master models.